A healthy diet is the key to living a vital life in a disease-free, strong and youthful body. But knowing what to eat in today's highly commercial and junk-food-oriented world can be challenging. Even if you've figured out what a raw diet can do for you, there are plenty of missteps that can be taken. After spending the early portion of my life trapped in an overweight and sick body, I slowly but surely began to transition away from what was harming me: unhealthy food. Today, after years of research and experimentation, I do not get sick, the last of my maladies have disappeared, and my energy seems boundless. I know what finally put an end to my problems: achieving raw food health through a low fat uncooked diet centered on fruits, but also including plenty of vegetables and some nuts and seeds. 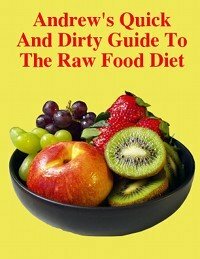 Want to get a free ebook that will guide you towards improving your health with a raw food diet? Sign up for the raw food health journal below at no cost and receive Andrew's Quick and Dirty Guide To The Raw Food Diet for free. I look around me and see plenty of people suffering needlessly. They want a lean, supple, youthful, and healthy body, but are trapped in a diseased one layered with fat. They want the energy to pursue their dreams, but it's all they can do to lie prone in front of the television. They want to eat better, but they're always hungry or tempted by junk food. My goal for this site is to give to others for what I only found through endless reading and missteps. Health can be anyone's to have without a supplement purchased or a super food consumed, and I hope to guide you toward it. At raw-food-health.net you'll find scientifically-valid explanations for why a fruit-centered diet is best, raw food recipes, advice for getting and staying on the diet, and much more. Remember that raw food health is open to anyone who decides to have it. You'll probably want to start off by reading exactly what a healthy raw food diet entails in this introductory article. Below you'll find a list of other articles that may be of interest. The Raw Food Blog - Keep up to date with new happenings at the site. Ask Andrew a Question - Ask me a question and I'll do my best to answer it. 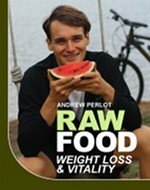 Andrew's Story - How I lost 55 pounds, overcame colitis, and found unbelievable amounts of energy on a raw food diet. 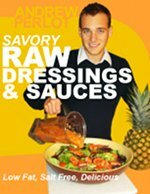 Savory Raw Dressings And Sauces - Creating sinfully delicious but perfectly healthy low-fat raw dressings using whole fruits, vegetables, and herbs. The Raw Lifestyle - Andrew's popular ebook on finding passion and happiness in your life. Reader Favorite Recipes - Find a recipe and then submit your favorite. Introduction To A Raw Food Diet - What should you eat, and how much of it? What should be avoided? This article lays it all out. New Pages - Chronological list of site additions. The Raw Food Lifestyle - Diet isn't everything. A raw food lifestyle will ensure your health and well being. How to Overcome Diseases Naturally - Find natural cures for your disease without taking a pill or a trip to the doctor. List of Raw Foods -There are lot of foods that you can eat raw. This list will help you make good decisions on a raw food diet. Use Raw Food Weight Loss To Shed Pounds Painlessly - Need to slim down? Raw food weight loss allows you to keep your stomach full while shedding pounds and feeling great. Low-Fat Raw Food Success Stories - Read inspiring raw food success stories about people escaping disease, loosing weight, and achieved amazing athletic success on a healthy raw food diet. Fruit Nutrition - Fruit nutrition is simple: fruit is the best thing you can eat. See why inside. Save The Environment: How What You Eat Changes The World. - Save the environment by starting at the dinner table. What you eat to fuel your life has a profound impact on the world around you. Fruit Guide - This helpful fruit guide will show you how to select, store, ripen, and care for the fruit that you buy. A Fruitarian's Fruit List - A fruit list including many of the mundane and exotic fruits you'll find around the world. Natural Body Care - Natural body care is all about what you don't do. Rid yourself of Body odor and harmful chemicals in your life by simply being healthy. Growing Organic Food Can Save the Earth, Your Wallet and Your Health - Learn techniques for growing organic food, which will improve the taste and quality of what you eat, let you achieve some level of economic sovereignty, and help regenerate the earth. Looking For A Natural Culture - Yearning for a natural culture is a normal part of a raw food transformation. Here are some ideas to get you started. Raw Food Videos - Fantastic raw food videos to improve your diet and lifestyle. Raw Food Recipes - Want raw food recipes that are healthy and don't use harmful additives like salt? Tired of fatty raw junk food? Look no further for delicious meals. Mind Over Matter - Work on your mind and improve your life. Book Reviews - Suggestions and reviews for the best natural hygiene and self improvement books out there. Raw Food Products You Can Use - You don't need much more than a knife to achieve raw food health, but these items are certainly helpful. Donate to Raw-Food-Health.net - Donate to support this site. Use this page to contact Andrew. The Raw Food Health Blog keeps you up-to-date with all additions and changes to the raw-food-health.net web site. Inject your life with passion and find the keys to succeeding on a raw food diet. The Raw Food Lifestyle now! This is a book that will be enjoyed by anyone who has an interest in improving themselves, not just raw foodists! While reading this book I started to feel really excited. Excited to take some of these strategies and apply them to my own life. At different parts of the book I thought of various friends and family who would also gain much from reading it and made a note to recommend it. You definitely have to check out Andrew's e-book. I have to admit that I was really stressed out last week...At first I thought reading his book would be just one more task on my to do list, but it turned out to be so much more. I became more relaxed, had fun reading the book and tackled the rest of my list with ease. ...It will have you conquering your own anxieties and putting things in the right perspective. Try the Raw Food Lifestyle today!